Guess How Much I Love You is an popular and award-winning children’s book written by Sam McBratney and illustrated by Anita Jeram. 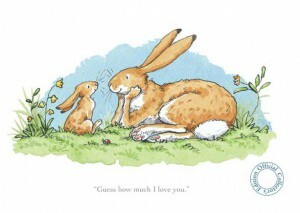 Now SLR Productions has created Guess How Much I Love You: The Adventures of Little Nutbrown Hare, a 2D animated TV series with young children in mind. Like the book, the series takes place in an idyllic woodland where Little Nutbrown Hare lives and learns with his father, Big Nutbrown Hare, and all their friends. The series has been running on Disney Junior Australia, and is set to premier soon on Disney Junior USA. If you check out the SLR Productions web site for the show, you’ll find a link to another interesting TV series they’re working on called Captain Flinn and the Pirate Dinosaurs. Yes. Well, that’s all for now. Except, of course, to say MERRY CHRISTMAS and HAPPY HOLIDAYS to you all. We’ll see you in 2012!